Already since his earliest childhood he has been journeying on steep pathways in the Tyrolean Mountains, which then lead him, the teacher from Innsbruck, after many passionate years of climbing between the Wilder Kaiser and the Dolomites, to absolve the schooling as a mountain guide. His first experience on the mountains of the world was made in the Andes. Afterwards, there were many expeditions that took him all over the world to the Nanga Part, the Dhaulagiri, the Shisha Pangma, the Cho Oyu, the Gasherbrum and the Everest. 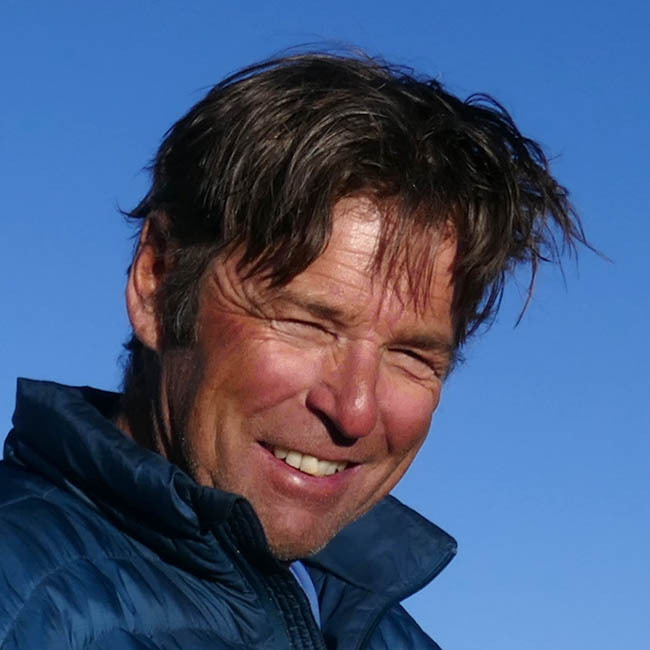 Andreas is a passionate expedition mountaineer, already the careful preparation of the ascents of the mountains is exciting, and this excitement is then increased even further when departing with guests and friends on reckless adventures. Also truly exciting is overcoming the challenges in strong teams. It is the combination of travels to exotic countries and ascending mountains in hidden edges of the larges mountain ranges. All of these things are reasons why Andreas is drawn to expeditions like these. For him, as a mountain guide, it is a special privilege to play a part in the realisation of the big dreams of the participants. Important during this is: the goal might be the summit, but the way there is just as fascinating.